A HARLOW UKIP activist has slammed the links that Harlow Labour candidate, Suzy Stride has with the unions. 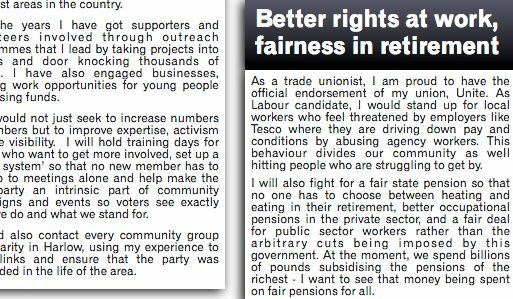 In her leaflets, the parliamentary candidate, Suzy Stride, tells prospective voters that: “I am proud to have the official endorsement of my union. I would stand up for local workers who feel threatened by employers like Tesco. But Harlow UKIP spokesperson (and former Tory councillor) Mark Gough believes that the union links are too strong. Mr Gough has sent a message to all press regarding his concerns. Speaking to YH, Mr Gough said: “Harlow residents need to be reminded that with the Labour candidate as with many Labour councillors, it is union first, residents second. Ms Stride did not supply a reply before we published this article.